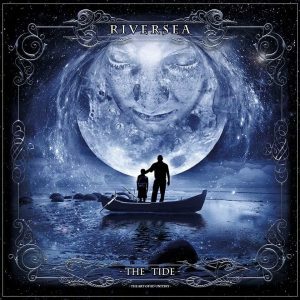 Riversea can never be accused of rushing the recording process, their debut album Out Of An Ancient World being released in the spring of 2012. However, when time and care is taken to pay meticulous attention to detail it shows in the end product. From the outset it is plain to see and hear the fruits of their labour choosing as they have Ed Unitsky to continue the Riversea livery with his wonderful artwork and a myriad of musicians hand picked for their various expertise which include Lee Abraham (Galahad), Robin Armstrong (Cosmograf), Simon Godfrey (Tinyfish), Tony Patterson and Mostly Autumn’s Olivia Sparnenn Josh to name but a few. 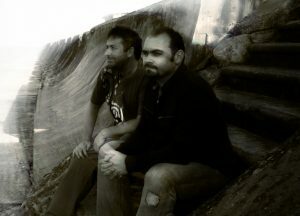 The core of Riversea is of course Marc Atkinson lead vocals and backing vocals and Brendan Eyre Keyboards,Piano,additional guitars,additional percussion and programming. Messrs Atkinson and Eyre are aided and abetted by David Clements on bass and Alex Cromarty (Mostly Autumn / Heather Findley Band) on drums. The Tide finds Marc Atkinson’s focus mainly on current world events and as a consequence invokes quite a dark theme over the album, though this makes it no less of a compelling listen. The various musical influences of bands like Pink Floyd are plain to hear from the Wish You Were Here style opening of the title song The Tide. The powerful atmospheric soundstage is deep and filled with expansive strings and Brendan Eyre’s signature piano sound. As well as being musically powerful it also has weighty lyrics which draw in the listener who may well find themselves nodding in agreement. As can be found elsewhere throughout the album Marc Atkinson’s lyrics cover so many of the things around us that at the present time touch us all. The plight of migrants fleeing from war torn countries to our lack of understanding and in some cases lack of compassion. The Tide ends as many of the songs throughout with scale and large scale production. This is helped in no small way with lots of subtlety’s like Olivia Sparnenn Josh’s backing vocals and Peter Aves Gilmouresque guitar licks. Shine (not to be confused with the song of the same name by Take That) finds Alex Cromarty laying down a gritty beat and Brendan Eyre playing an Adam Holzman (Steven Wilson Band) style electric piano and Lee Abraham adding a ballsy guitar solo. Shine is without doubt one of the more upbeat songs here and one that i warmed to instantly. In stark contrast the subject of war, terrorism and the slaughter of the innocent in the thought provoking Blasphemy. The use of sound bites and samples here enhance the mood of the piece which remains steeped in it’s solemnity for approximately Three and a half minutes before a quickening of the pace and guitarist Paul Cusick finishing the song quite nicely. The sad tale of misplaced people is highlighted in the heart wrenching The Design, a testament to Marc Atkinson’s song writing prowess. The Design paints a pretty bleak picture as do other songs throughout The Tide. Indeed many of the songs are solemn, meaningful and atmospheric, none more so than Fall Out Warning. Here Brendan Eyre’s Northlands cohort Tony Patterson lends his talent on flute further adding to the peaceful nature of the song which has some fine nuances including hints of Dobro and a great Mellotron sound. The atmospheric approach to these songs continues with Goodbye My Friend a lament to one of Marc Atkinson’s Late friends Andy Sedon who played bass in one of Marc’s previous bands Gabriel. Great synth solo by Brendan and guitar solo by Peter Aves. A fitting tribute delivered in Mr Atkinson’s usual soulful nature. One thing noticeable is the way the songs flow. A great deal of thought has been put into the running order of these songs and following such a heartfelt tribute it was apt that a small scale production follow on. Hence the haunting To Those Who Are Left Behind. A simple piano and voice piece which has you thinking once again about the state the world is in. This album is dark there is no doubt about that. It also represents a huge musical statement rich in sentiment and musical know how. Equally haunting from start to finish is the penultimate piece Uprising. Lee Abraham having the final word on the guitar front and a sterling job he makes of it too along with Tony Patterson on flute and Janine Atkinson singing backing vocals. 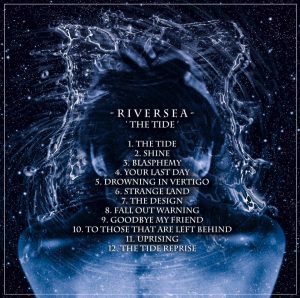 Riversea offer up a suite of meaningful compositions finished off with a reprise of the title song all of which are well executed and certainly a worthy successor to their previous debut Out Of An Ancient world, an album that garnered them a lot of fans. The Tide builds on the strengths of Out Of An Ancient World and worthy continuation of the bands writing and composition skills not to mention the textures and selection of supporting musicians. Ultimately there will be no need to don a white suit and black shirt. This album is no Saturday Night Fever soundtrack. it won’t have you dancing the night away nor will it have you playing air guitar. What it will do is have you basking in the beauty of Marc Atkinson’s songs and Brendan Eyre’s music. Sure, The Tide isn’t a happy album in fact it is rather bleak in places but what it has in spades is substance. Fans of Riversea will not be disappointed and the lengthy wait they had for a worthy follow up is well and truly over. The Tide has finally come in. For release Late April 2018.